If you haven’t seen the first iteration of ArtsHacker’s Most Creative People In Arts Administration, hop over there now and check it out. If there was one thing I learned as a member of the review panel, it was that there are a lot of unrecognized arts administrators doing great work out there. This year Juan José Escalante, Executive Director of José Limón Dance Festival and Aubrey Bergauer, Executive Director of California Symphony both deservedly tied for top honors. One thing that impressed me about Bergauer’s nomination were support documents that included the symphony’s blog. To be certain, there are only a few entries on the blog, but the one I appreciated the most discussed the results of discussion sessions they conducted with Millennials and Gen Xers. 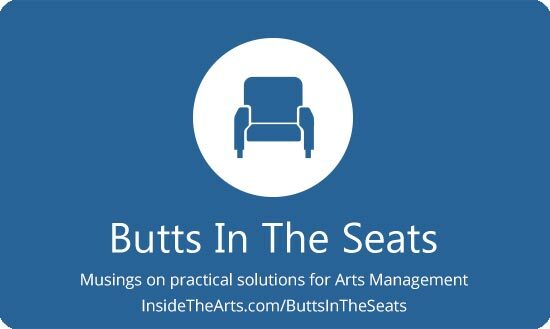 The blog post is a treasure trove of great feedback for any arts organization since there is very little that is specific to the California Symphony. The things discussion attendees wanted to know but weren’t finding easy to access included things like: why is this music a big deal?, how long will it run?, what will the experience be like?, what are each of the instruments called? The music selected for the program mattered least. There were a lot of quotable sections of the blog. Here are some of my most favorite favorites. Then, they get to step 4): make a decision on why they want to attend a specific concert, and our response is essentially “WHY CAN’T YOU FIGURE OUT WHY RACHMANINOFF’S SECOND SYMPHONY IS A BIG DEAL? LOOK IT UP IF YOU WANT TO KNOW!” (marketing failboat — why do we set up our sites this way, and then wonder why the sales funnel is getting choked up at the add-to-cart step?). One participant asked if there is “a separate webpage for younger people we could make?” What was so interesting about that comment is that this person assumed that they were in the minority as far as understanding answers to these types of questions. The assumption was that other, older people are much more familiar with the symphony when in reality, there is no magical age at which one suddenly becomes an aficionado. Even the discussion group brought up (on their own, without any prompting) the idea that they’ll all shell out big bucks for Taylor Swift. So price alone is never an isolated issue; it’s all about the perceived value one is receiving in exchange for that price. What we did find interesting was the comment of, “I’m more likely to go to three $25 performances than I am one $75 or $100 performance.” Many others chimed in with agreement to that statement. Okay, now you can go over to the Arts Hacker site. Thanks for reading.